Summary Broadcom-based single-band 802.11bgn access point with Enterprise feature set and 802.3af PoE. 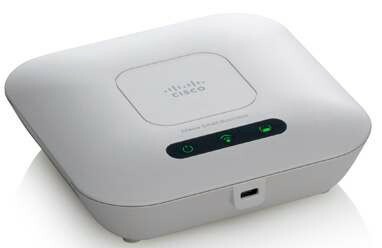 If you liked what you saw in Cisco's WAP321 [reviewed] small-biz access point, but want a less-expensive, single-band alternative and don't mind giving up a few features, then the WAP121 is for you. Since I covered the feature set in detail in the WAP321 review, we're going to take a quick look at the hardware and feature differences and move right on to performance. Figure 1 shows the simple back panel, which has a 10/100 Ethernet port vs. the 10/100/1000 port on the WAP321. Both, however, support 802.3af PoE and have three bi-colored lights on the top of the WAP—power, WLAN and LAN—that flash and change color to indicate status. Folks without access to PoE switches will appreciate that the WAP121 comes with the 12V wall-wart power adapter that the WAP321 lacked. Figure 2 is a quick photo I snapped comparing the sizes of the WAP121 and 321. The 121's footprint is about the size of a CD jewel case. The 121 comes with a mounting plate similar to, but smaller than the one supplied with the WAP321. However, it has the same weaknesses of the WAP321's plate, i.e. no way to lock the AP to it either via mates to the Kensington locking slots on the AP's front and rear or another mechanism. The plate's rear shroud covers the ports and power switch and has a knockout for cable routing and a hole for reset switch access. The FCC photos weren't clear enough for me to identify all the components. So after testing I opened up my sample for a look and found a view similar to the FCC photo in Figure 3. Table 1 summarizes the key components, which show another Broadcom based design. The FCC ID prefix indicates that the WAP121 is manufactured by Sercomm, the same Taiwanese OEM that makes the WAP321. The antennas are both 2 dBi metal PIFA (Planar Inverted F Antenna) patch type. Figure 4 shows an unobstructed although somewhat fuzzy view of the board with the heatsink removed from the Broadcom BCM5358 SoC that does most of the heavy lifting in the AP. Note that there are no external RF power amplifiers or front ends up near the top center of the board.